Picture Don Draper on vacation: rum cocktail in hand, wind blowing through that meticulous coif. While you may never have Jon Hamm’s cut-from-glass jawline (sorry), you can make like a Sterling Cooper adman at leisure in this retro-kitted tiki lounge, from Tijuana Picnic partners Jon Neidich and Jim Kearns. 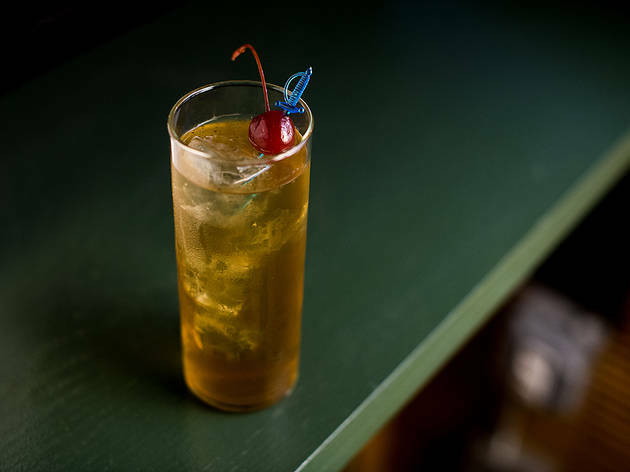 The bi-level bar is crammed with mid-20th-century curios—a ’60s pop soundtrack; mod, half-moon booths; waitresses in Chuck Taylors—but it’s the customizable cocktails and breezy vibe that win over the crowd. 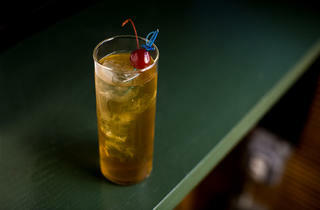 ORDER THIS: Renowned barman Kearns (Pegu Club, the NoMad) prompts you to pick your poison, creating a cocktail list ($12) that seamlessly matches a variety of spirits. 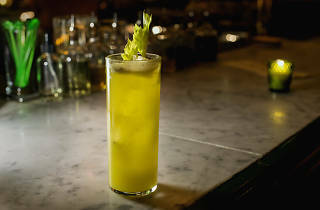 The Link Ray—playing on Cel-Ray soda with house-made celery pop, zippy lime and Suze bitters—is the most versatile of the bunch, available with a choice of rum, gin or tequila. 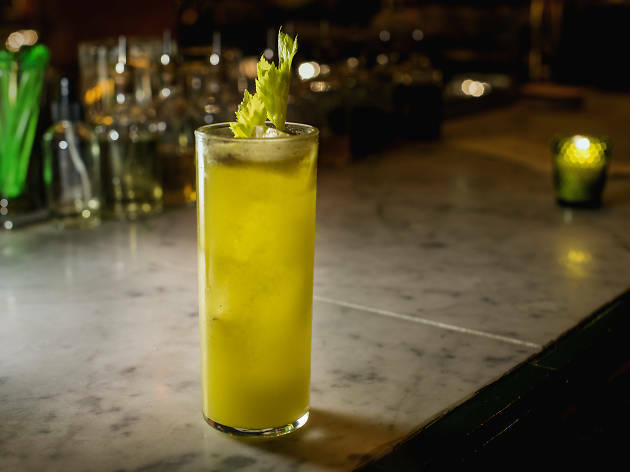 Sweet rum helps play up the drink’s natural sugars, gin mirrors the celery’s vegetal brightness, and the jalape–o-infused tequila proves a fiery foil to the mild quaff. Skip the Little Red Dress, a bitter cocoa-and-strawberry flop, in favor of a Sugar Shack: With maple-syrup sweetness and a slug of toffee-tinged Evan Williams bourbon, it’ll tickle you and your inner child. GOOD FOR: Cheeky ’50s-housewife–inspired snacks. 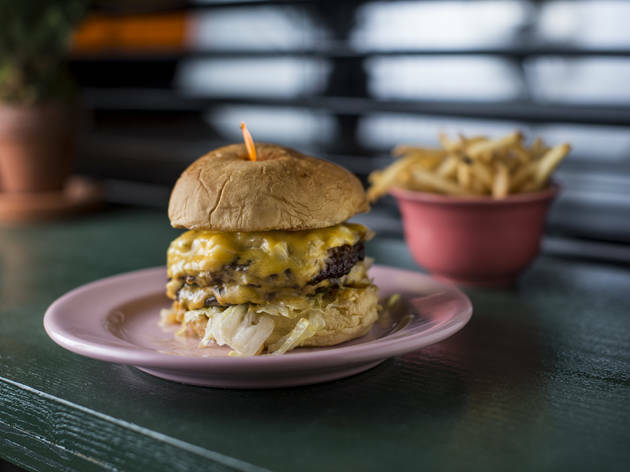 The dinerlike placemat-menu ranges from light bites like hot-sauced cucumbers ($6) and sautéed brussels sprouts ($6) to the hulking Happiest Burger ($12), smothered in American cheese and confit onions. Before getting tucked into a fluffy Martin’s potato roll, the pair of flattop-griddled patties is slathered in a relish-forward secret sauce that oozes from every edge and requires some serious finger-lickin’—but you’ll happily oblige. THE CLINCHER: You’d be hard-pressed to find a group that didn’t fit in at the floating horseshoe bar or low-lit dining room. The crowd of twentysomethings spans off-hours suits sipping Scotch on the rocks, bubbly girl groups clinking wine glasses, polo-clad bros glugging Miller High Life and couples cozying over cocktails in velvet booths. 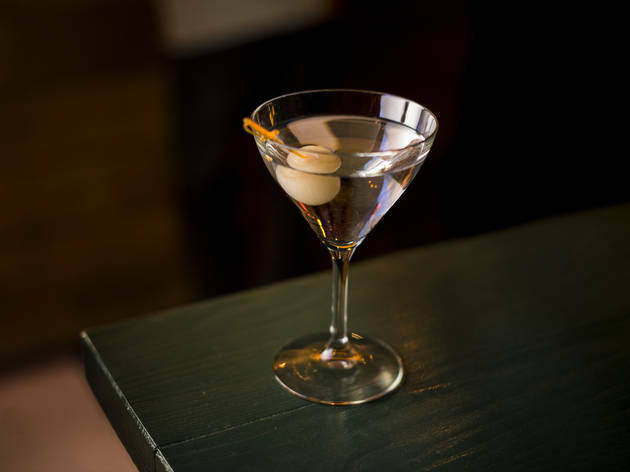 Take your buddies, bring your bae, or go stag—here, a top-rate happy hour is anyone’s game. Average cocktail: $15. 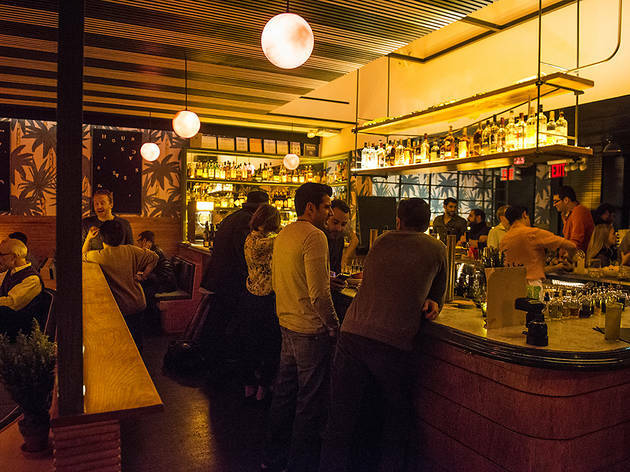 AmEx, MC, V.
Visited the Happiest Hour and will never ever return. Stopped by with some friends and the service was slow and the drinks were over priced and watered down. Such a classic bar and really great cocktails! There's usually a line on the weekends but it never feels that packed inside which is nice for the neighborhood. 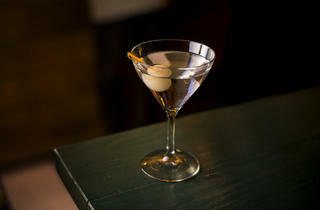 The Happiest Hour was at its finest when it first opened, before it became a hot spot with long lines. HOWEVER, it is still an awesome bar for weekdays. 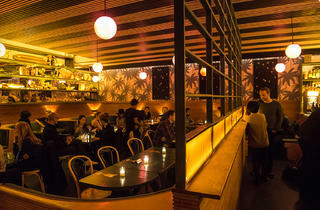 The tiki vibe is elegant and kitschy all at once - a rare pairing. And the dynamic between the seated back area and the lively front area works really well. I love their cocktail menu, a kind of reverse-bespoke: they list out the ingredients, you pick your poison (aka, alcohol). The location is ideal - surrounded by great restaurants (though I hear their burger is very good) and close to the subway. The chill vibe and draft Tiki cocktails are reason enough to fight through the throngs of happy hourers for a seat in one of the booths here, but the real move is the burger. The aptly named Happiest Burger is one of the finest in the city, two thin patties, beautifully melted cheese, secret sauce, and a classic bun. It's a thing of beauty, greasy, messy, cheesy beauty. I would give this place between 3.5-4 stars, because there's usually an annoying line and many a time you have trouble hearing yourself think, but it's a fun place to go out with a group and there are always good looking people around. The cocktail menu is also nice, because you can choose the liquor you want, but they're not my favorite cocktails in the city. I do like the vibe and the interior though, and I keep coming back, so just don't come here expecting to have an easy conversation. Do come to flirt and drink. Also, I've heard a lot about their burger, but I haven't tried it yet, so keep an eye on that too. 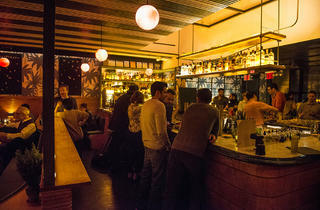 I visited the Happiest Hour last night and this is a must visit in the West Village. This tropical inspired venue instantly conjures up feelings of Miami Spring break with palm trees adorned on the walls and bartenders wearing floral printed shirts serving seasonally crafted cocktails. I was greeted with a jovial smile and perfectly crisp complimentary fries served with a house made slightly sweet ketchup that makes you want to eat the entire bowl. The accommodating mixologist whipped up a clever drink with Pisco, Pineapple, and egg white that made me forget it's winter outside. 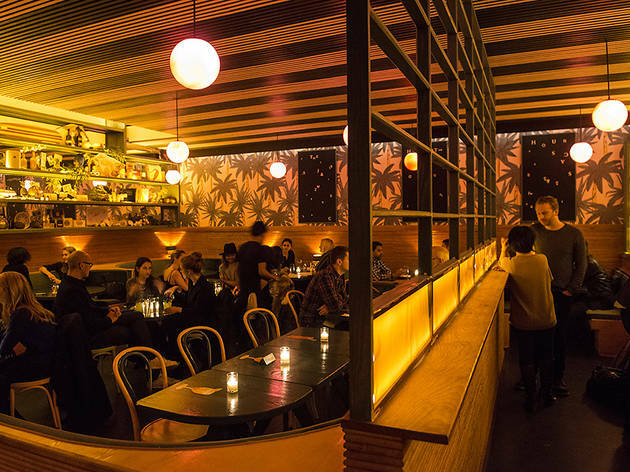 This West Village gem is perfect for cocktails in any season. Rumor has it, the burger here was like the love child of Inn ‘n Out and Shake Shack. Confirmed. The Happy Burger (one patty) and the Happiest Burger (two patties) are in fact an all-American grand slam classic. Well done, guys. 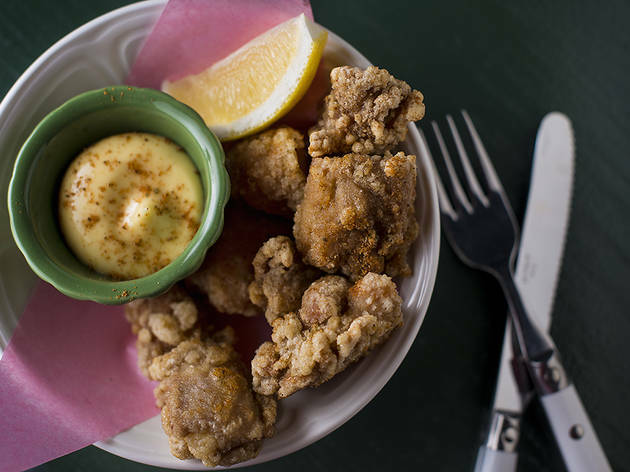 The food menu at this relatively new West Village cocktail bar didn’t stop there – in a world where brussel sprouts are losing steam (no pun intended, these are roasted!) 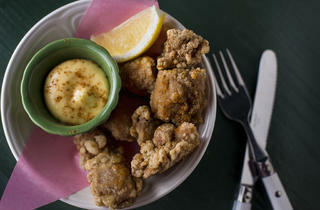 – they revived the dish with a relish, honey vinegar. The taste of the sprouts is captivating and begs you to order a second serving. At only $6 a side, it happens. They also boast a WBBLT (worlds best BLT) among other drool worthy sandwiches. Okay, my drank (and my two step): the Manhattan was done well and then I moved on to their more fun set of the menu, a kind of choose your own adventure in a glass. The components were listed, and you choose a liquor. The Maid to Order with tequila may be my drink of summer, it’s crisp and refreshing. Mint + cucumber + lime juice + tequila. YAS. Don’t stop there though, you can go all night between the cocktails and their beer and shot special (Gansett + Evan Williams). The downside(s), there seems to only be one bathroom, and I don’t think they actually have happy hour.